The Student Living Center (SLC) Front Desk is located at the main entrance of the Student Living Center. When entering the building, all students, faculty, and staff must show their IDs to Office Assistants working at the SLC Front Desk. Visitors are required to sign in at this location. The SLC Front Desk also lends supplies to residents such as games, movies, and cleaning supplies. Here is a complete list of items that can be checked out. The Office for Residential Life is located on the first floor of the Student Living Center. More information regarding the Office of Residential Life can be found on this webpage. The Office for Student Activities and Engagement is located on the first floor of the Student Living Center. Information regarding the Office of Student Activities can be found here. The Dining Center is located on the first floor of the Student Living Center where Eastman students can utilize their meal plans. More information regarding Dining Services, including information about hours and meal plans, can be found here. Safety and security is taken very seriously in the Student Living Center. All visitors must sign in at the Office for Residential Life and stay with a current resident who presents a UR ID card. Public Safety officers are available on-campus all day, and have offices in the main academic building, as well as the Student Living Center. For an emergency, Public Safety can be reached by picking up a blue light phone or calling (585) 275-3333. More information about Public Safety can be found here. The University Health Service office is located on the first floor of the Student Living Center. This office is open Monday-Friday from 9:30am-4:30pm. Additional hours and locations can be found on the UHS website. UHS also provides a Physical Therapy office in the basement of the Student Living Center. Information regarding regarding physical therapy can be found here. The University Counseling Center office is located on the first floor of the Student Living Center. Information regarding scheduling an appointment can be found here. The Bike Room is located in the basement of the Student Living Center. There is limited space available, so please contact the Office for Residential Life to find out more information about registration and fees. Ciminelli Lounge, located on the first floor of the Student Living Center, is a space for recitals, recordings, auditions, and masterclasses. Any student, faculty, or staff member wanting to reserve this space must place a reservation through the Concert Office. More information about Ciminelli Lounge can be found here. The Alumni Courtyard provides a beautiful outdoor enclosed space for residents to hangout and relax. The Game Room is located in the basement of the Student Living Center. Equipment available to residents includes pool, ping pong, air hockey, foosball, and poker tables. The key to this room can be signed out through the SLC Front Desk. In addition to the microwaves that can be found in most floor lounges, there is also a full kitchen provided to all residents in the basement of the SLC. The kitchen is open daily from 7:00am – 11:00pm. The Laundry Room is located in the basement of the Student Living Center. This facility is available to Student Living Center residents only. Washers and dryers are free. Residents are responsible for providing their own detergent. A computer lab, accessible exclusively to Eastman students, is located on the first floor of the Student Living Center. The computer lab provides first-rate equipment, and is open 24/7 during the academic year. More information on the technology provided, hours, and printing costs can be found here. The Meditation Room key can be checked out at the SLC Front Desk. This space is designed to be a relaxing atmosphere where Residents can do yoga, meditate, work on their Alexander technique, or focus on their spiritual practices. Mail and packages are delivered directly to the Student Living Center. All residents are provided with a mailbox in the Mail Room located on the first floor of the Student Living Center. Packages are held in the Package Room located on the first floor of the Student Living Center, and is open Monday-Saturday from 5:30pm-7:30pm and 9:30pm-10:30pm. If you have questions regarding mail, packages or mailboxes, please contact the Office for Residential Life. The Reed Room, a unique asset located in the basement of the Student Living Center, is for the reed-making convenience of our double reed players. Residents need to register for a key to this room through the Office for Residential Life. The Student Storage Rooms are located in the basement of the Student Living Center. If you are interested in storing some of your items, please contact the Office for Residential Life to find out information about registration, fees, hours, and details on what you may store. The Study Lounge is a quiet studying space located in the basement of the Student Living Center. The TV Lounge is located in the basement of the Student Living Center. Game systems and equipment can be signed out through the Office for Residential Life. 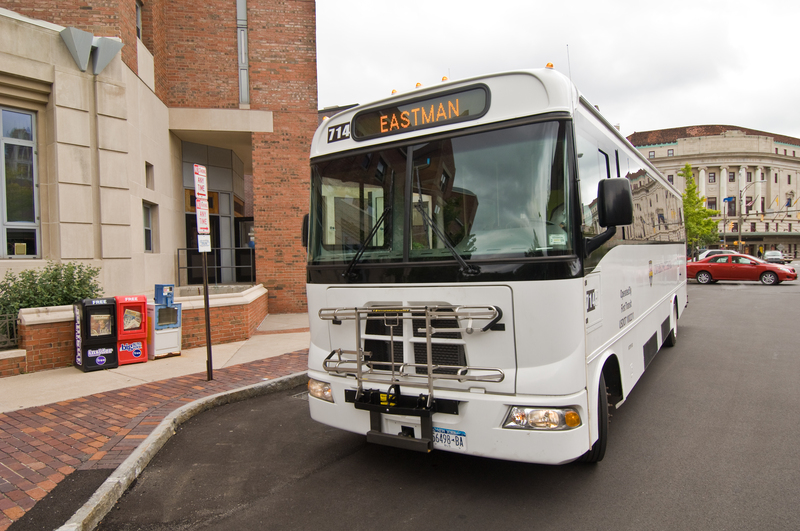 The University of Rochester provides free shuttles to students with a UR ID. The shuttle transports students to and from the River Campus, with various other lines available from the River Campus. Click here for the most updated schedules.